Preheat the oven to 180c and line an 8×8 inch dish with parchment paper. Crack the eggs into a jug and beat lightly with a fork. Add the grated cheese and flour and mix again. Add the frozen peas, red pepper and herbs and mix one last time. Pour the egg mixture into the baking dish and bake in the oven for 10 minutes. 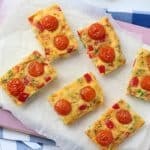 Remove from the oven and place the cherry tomatoes on top, lightly pressing down into the frittata. Allow to cool for a few minutes before lifting the frittata out by the parchment paper and then cutting into six fingers.